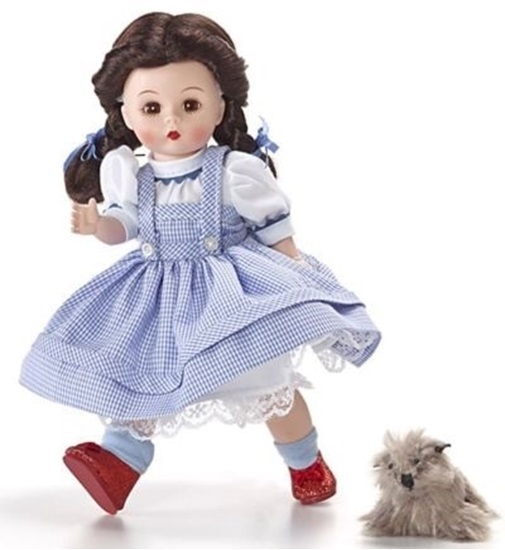 From the classic story, Wizard of Oz, Dorothy with her plush Toto, had a fresh new appearance in 2015. This is an 8-inch fully articulated Wendy doll with brown eyes and center-parted brunette braids trimmed with blue satin ribbons. She is dressed in the traditional blue and white gingham pinafore with a white blouse. A white petticoat, blue ankle socks, and the iconic ruby red slippers complete her outfit. Fun for everyone, “Dorothy with Toto” is sure to be a wonderful addition to any collection.